Place carrot strips in vinegar and allow them to marinate for 15 – 20 minutes. Brush chicken breasts with oil. Sprinkle with salt and pepper. Cook chicken, let rest for 5 minutes and then slice into pieces. Mix mayonnaise and hot sauce and set aside. Cut baguette into four sandwiches. Spread spicy mayonnaise on bread. 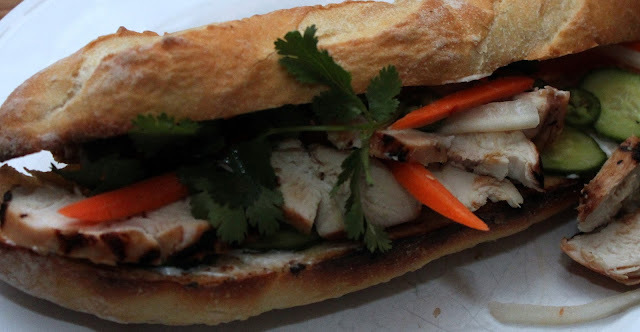 Top bread with chicken, carrots, cucumber, sesame seeds, cilantro and finally top with lettuce.